Mississippians are truly fortunate. Those reading this within the blessed border should already know what I mean. Those reading from foreign lands like Cyprus, Egypt, or Kentucky may be suspicious. We do get a bad rap sometimes because of various and sundry rankings, some of which may or may not be related to our interest in frying our edibles. But the truth is that we grow some of the healthiest food in the country. Consider the sweet potato. According to a poster I recently saw on the wall of the school cafeteria in Vardaman, The Sweet Potato Capital of the world, sweet potatoes are virtually fat-free, cholesterol-free, and loaded with anti-oxidants like vitamins A, C and E. I even saw a couple of references that made the claim of it being one of, if not THE most nutritious vegetable around. Mississippi definitely has reason to be proud as one of the top five sweet potato-producing states. And according to the poster, 90% of the ones grown in Mississippi are within a 40 mile radius of Vardaman. Sweet potato capital, indeed. As I began to think about this subject, I was sitting in BIN 612 having lunch and added a sweet potato to my order. Nutrition aside, I like their versatility. Baked, I can take the cinnamon/brown sugar route or simple salt and pepper (both must have butter.) Mashed, they go in my biscuits, cornbread and grits. I like them diced in my soup or sliced and candied like Mama used to make. It didn’t cross my mind until my lunch arrived that the next day I would be headed to Vardaman for an afternoon of sweet potato eating. I ate it anyway, but I’m sure all the other folks at the BIN wondered why I was grinning at my food. This was my second year as a judge for the annual Sweet Potato Recipe Contest, held on the last day of the week-long festival honoring the orange root. You would think I would have learned something from last year, when I waddled away from Vardaman, full as the proverbial tick. But no, my attempts at moderation were defeated. 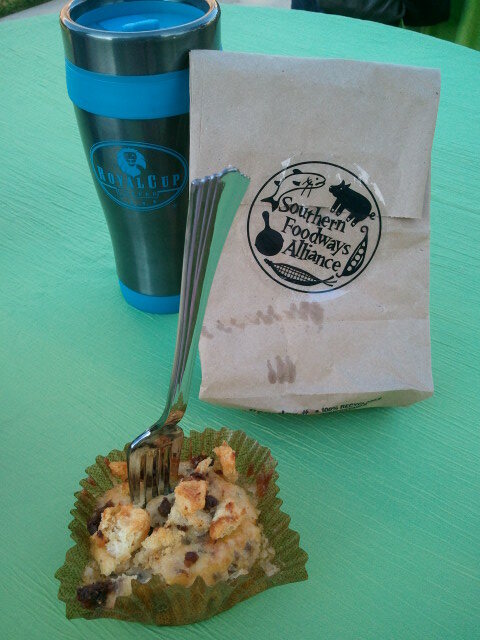 I succumbed to the versatility of the sweet potato and the creativity of the worthy cooks of Vardaman, Mississippi. Willingly. After the judges were paired up, we were asked if we had a preference of categories. I knew we couldn’t go wrong in any of the genres, but given the proclivity for pies and cakes, I wanted to check out the savory recipes, so my partner and I headed off to the miscellaneous table. Some of the entries were still sweet, such as the Sweet Potato-Pineapple casserole, a Sweet Potato Honey Bun Cake that may have been the sweetest bite in my mouth that day, and a Sweet Potato Flan. 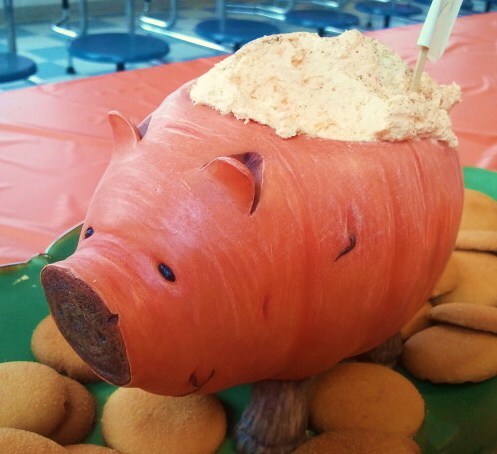 A Sweet Potato Harvest Dip, served with vanilla wafers, was contained in a pig, cleverly carved from a fat sweet potato; had there been a design category, this surely would have won. Something called Tater Wraps was also on the sweet side – a chunk of sweet potato wrapped with strips of dough and smothered in glaze – one of my favorites of the day. We did eventually get to the savory dishes I had requested. There was a Sweet Potato Shrimp Dip, a Sweet Potato Salad (think normal potato salad, but with pineapple instead of onion and lots more color), and Sweet Potato Cornbread Poppers. The Poppers were little cookie-sized pieces of cornbread that were dotted with lots of other veggies, too, including greens. Vardaman Trash was basically a hot refried bean and cheese dip with chunks of sweet potato mixed throughout. Definitely a first for me, but I liked the sweetness the potatoes brought to the bite. Leading the winners in this category was something called Southwestern Duo, another hot and spicy dip with chicken, black beans, corn and – of course – sweet potato. (That was kind of a requirement.) Multiple bites of this certainly contributed to the difficulty I had in sitting up straight an hour or so later. Rounding out the winners was another first that I hope is not the last: Sweet Potato Deviled Eggs. Just like regular deviled eggs (if there is such a thing as regular), but with pureed sweet potato mixed in with the yolks. The one savory dish in the men’s category was a dip called Sweet Buffalo Chicken. The buffalo sauce may have taken over the sweet potato in flavor and color, but hiding all that nutrition underneath the melted cheese might be a good way to get the kiddos to eat more of it! The men of Vardaman also provided us with a Ponana Pudding Pie (you can probably figure out what was in that one) and perhaps the most unique recipe I saw that day: Sweet Potato Tomato Soup Cake. Granted, there was not a lot of tomato soup in the recipe, but still – it’s not an everyday ingredient in the sweet shop. The Youth category may have given us the widest range of dishes. On the sugary side we had the winning Sweet Potato Bars and a Loaded Baked Sweet Potato (with roasted pecans and caramel sauce). A Sweet Potato Omelet was a breakfast option and a Quesadilla represented international food. The Mayor’s Cup winner was Wilma Johnson for her Simply Delicious Sweet Potato Cake. (It was.) 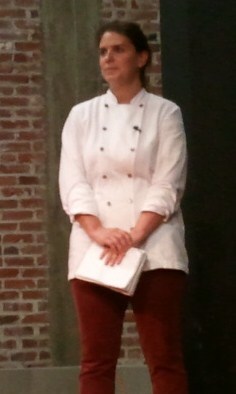 Lindsey Wade took second for her Sweet Potato Caramel Butter Bars – I couldn’t quit eating these. Third place was Barbara Williams for a Sweet Potato Chocolate Chip Pie. It had coconut in it, but it looked like the kind of pie I would otherwise love. Once I had tried everything I wanted (and snagged a cream cheese-stuffed muffin for the road) I moved the seat back as far as I could safely go, loosened my belt buckle, and regretted not wearing pants with an elastic waist. Happily stuffed, and a bag of Vardaman’s finest in the back seat, I set out for home. Is it over already? Do I have to go home now? I mean, I love Son and Daughter and all (though I’m not 100 percent sure we are missed when they are under the care of Doc and Gran), and there was that reality of our moving all our earthly belongings from one house to another the following day, not to mention the imminent arrival of Maw-and-Paw-in-Law – all important reasons to re-enter life, I grant you. But I was not ready to leave Oxford. I know that is a challenging idea for some of the cowbell-inclined – just try to see it from my point of view. The Southern Foodways Alliance Symposium is the weekend for which I deposit my birthday money, bank my vacation days, and yes: exercise. We had a half day and two meals left. There was some sadness. That sadness, however, was rather quickly abated with something happy: a biscuit sundae. If I have never had a biscuit sundae before, I’m going to go out on a limb and guess that most of you haven’t either. Vishwesh Bhatt, chef at Oxford’s Snackbar, served us bright red take-out boxes full of crumbled chunks of biscuit tossed with shrimp, tomato gravy and crisp pieces of chicken skin (the second time it was featured that weekend.) It was a box full of unique bites. Some with shrimp, some without. Some with the gravy soaked into the biscuit crumbs, some with the crunch of chicken skin. I don’t eat shrimp for breakfast very much at home, but I have learned that’s mostly because I’m a landlubber. Folks who live near the coast and make their living from the water often work from a different morning menu. So I’m more open to that now, and the more I ate this, the more I liked it. The Wife opted out. She wanted to try it, but told me her stomach said “no” in anticipation of the brunch to come. My stomach spoke a different language. After cleaning up mine, I just wanted another bite or two out of her box. I took those bites and then, mysteriously, it was gone. Most of the rest of the morning was focused on the late chef Edna Lewis. Miss Lewis, granddaughter of freed slaves, went north to New York from her home in Virginia, eventually becoming chef of Café Nicholson in NYC. Many years and four seminal cookbooks later, she is well-known in the culinary community (and highly-awarded) as a major influence in the genre of true Southern cooking. Between the sundae and lunch we got to know her a little bit via Shay Youngblood’s one-woman play: “Edna Lewis Requests the Pleasure of Your Company.” One of the many fascinating things we heard about was her menu for an Emancipation Day celebration, which was included in her cookbook, “The Taste of Country Cooking.” Shortly after the play, we all celebrated with an interpretation of that meal. At the outset, the plate looked like a simple meal that one might come across at a church banquet. Now I know I’ve probably gone to meddlin’ here, potentially upsetting the fine chefs that put this together, church banquet committees across the South, and the memory of Edna Lewis – so hear me out. A quick first glance (without any foreknowledge of menu specifics) would indicate we were about to eat chicken, rice pilaf, green beans, and rolls. Are you feeling the excitement yet? A closer look – still observation only – revealed that the bird was prepared several different ways, the pilaf had pecans in it, and the green beans had an entirely different vibe – not cut beans dumped out of a can and boiled to oblivion. Now we’re getting somewhere. The first thing I noticed when I picked up my plate and got in line was that the chicken seemed a little small. But small is relative. Chickens that graze and truly run free on the farm aren’t as chubby as the ones we commonly see on sale at the grocery, but they tend to have more flavor. In this case, however, I found out it wasn’t a chicken at all! 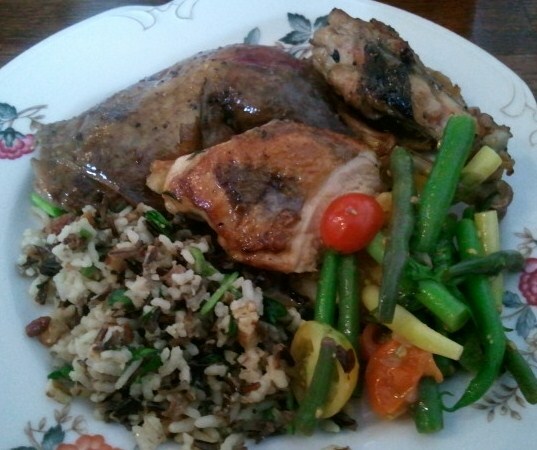 We were eating griddled, braised and grilled guinea hens from White Oak Pastures. This was my first guinea hen, and I thought it was delicious in all three forms. “Guinea some more!” I cried. (Not really.) The pilaf was wild rice and Carolina Gold with watercress and a healthy portion of pecans. Still a relatively recent convert to the pecan, I was somewhat suspicious, but the flavor and texture it added to the rice was quite nice. The green beans with cherry tomatoes in herb vinaigrette, as the name suggests, was more of a green bean salad than anything else, an interesting diversion from the norm and a burst of color on the plate. My sadness returned when it was time to fetch dessert. This was it. The last few bites and it would be time to exit, back to reality. But it was hard to stay sad with this little plate full of sweets. First was pound cake. Again, simple. 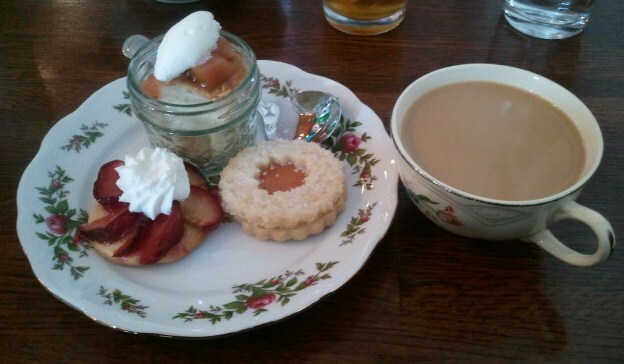 Served in a small jelly jar with a dollop of preserves (pear, I think) and whipped cream, it was hard to beat. But they tried. A purple plum tart was alongside, a circle of pastry anchoring a pinwheel arrangement of plum slices. Butter cookies with stewed quince filling. Quince. Wow. To go along with dessert, of course, was coffee. Eggshell coffee. At the time I just trusted my chefs and drank it. Since then I’ve learned that the alkaline properties of the eggshell counteract the acidity of the coffee. Makes sense. Lots to ponder, lots to try at home, and lots of calories to work off. No, I did not want it to end so soon, but we left happy. Amen. It was Hump Day at the SFA Symposium, the longest day of the event. At almost any other conference 13-14 hours of near-continuous activity might be a drag – or at least cause me to be dragging at the end of it. But not this one. Here we savored every minute, and every mouthful. Saturday traditionally begins early with an outdoor stand-up breakfast. In past years we have enjoyed some sort of breakfast sandwich but this time Virginia Willis (author of Bon Appetit, Y’all) made individual breakfast casseroles. Grits-based with cheese, sausage and something with a kick, it was a nice diversion made even more meaningful because we had eaten lunch with Virginia the day before, where she regaled us with stories from her time on Chopped and with tips from her new Okra cookbook. Between meals the Gee’s Bend Singers brought a little revival to the gathering, and we heard from Natalie Chanin, who confessed to over-handling her biscuit dough to great acclaim. Just before lunch Natasha Trethewey, the U. S. and Mississippi’s Poet Laureate, read poems from her friend the late Jake Adam York, last year’s symposium poet. This lunch came at a leisurely pace, course by course, allowing plenty of time to savor each dish and visit with our table-mates. We started with a piece of tomato pie served with preserved butterbeans, corn and charred okra. The Wife never remembered having tomato pie and isn’t a big fan of tomato-ey things, but she loved this. I thought it was the best part of the meal. 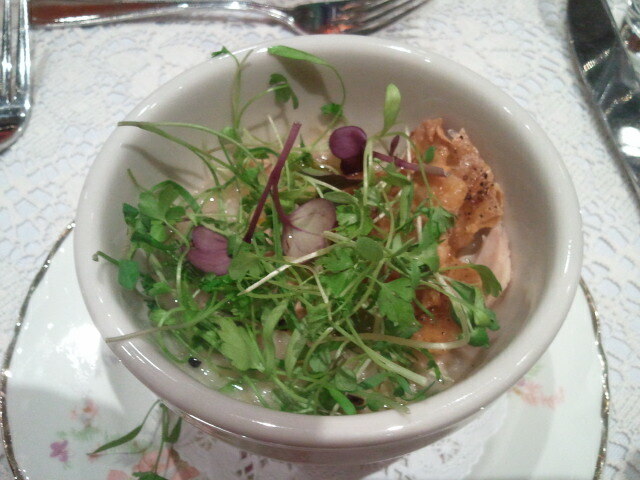 Next came chicken and rice with herbed chicken skin and Tabasco salad. There was nothing fancy about the chicken and rice, but it was perfectly seasoned and was the kind of dish that leaves the eater warm and comfortable. The microgreens salad it was topped with not only added a touch of elegance, but also provided an extra burst of flavor mixed in with the chicken and rice. And how about a dish where chicken skin is celebrated rather than discarded? Loved it. The main dish caused a bit of a stir, or at least triggered some intriguing conversation. 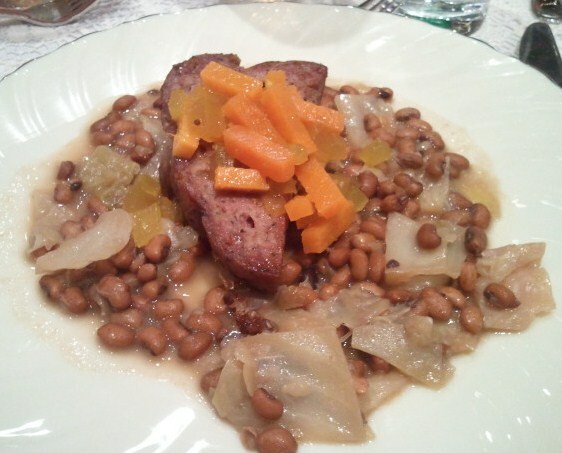 It wasn’t the Sea Island Red Peas and Cabbage, though those peas are not particularly easy to find. Neither was it the sweet potato-watermelon rind relish, which was also quite unique. The raised eyebrows and table murmurs resulted from the Tom Thumb Sausage. According to the description we were given, a Tom Thumb is a hot sausage stuffed into a pig’s appendix. (Everything but the squeal, right?) I never quite got it straight if the casing was actually an appendix or not, but whatever it was, I ate every bite. 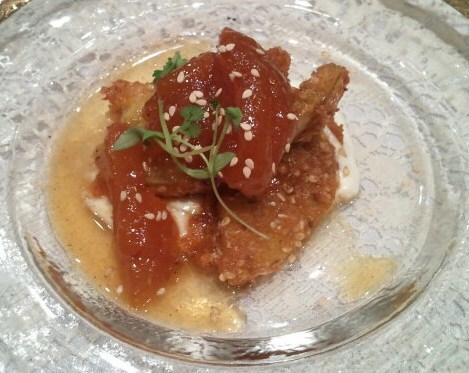 Dessert was a bit unorthodox, too – Benne Fried Green Tomatoes with Curried Peach Preserves and Whipped Goat Cheese. Goat Cheese is another of those foods I have tried to like – to very little avail. But in the proper proportion, in a bite that included the nutty crunch of the benne, the tart tomato, and the sweet preserves, I decided that Chef Vivian made it work. With all that goodness in us, plus a pack of Tabasco Jab Thumbprint Cookies for the road, we went back to hear a few more speakers before turning around to eat again. The first event of the evening was a Lincoln-Douglas style debate between Kat Kinsman (CNN’s Eatocracy), who spoke eloquently on behalf of pie, and Kim Severson (NY Times) who defended the cause of cake. Both presented persuasive arguments and the debate was declared a draw, but I confess I clapped a bit harder for pie. Perhaps I was influenced by the box in my seat, which contained a fantastic dried apple hand pie and a piece of coconut cake prepared by pastry chef Lisa Donovan (Husk Restaurant, Charleston). Thankfully I was able to brush off the few offending coconut flakes that found their way onto my pie. So, yeah, in the box pie definitely won. Sure, dessert came before dinner that night but that’s okay – we were all food-focused grown-ups who wouldn’t dare allow dinner to be ruined, no way, no how. They called this one the Lodge Cast Iron Fried Chicken Feed. All were given buckets and we lined up outside the Powerhouse to load them up. 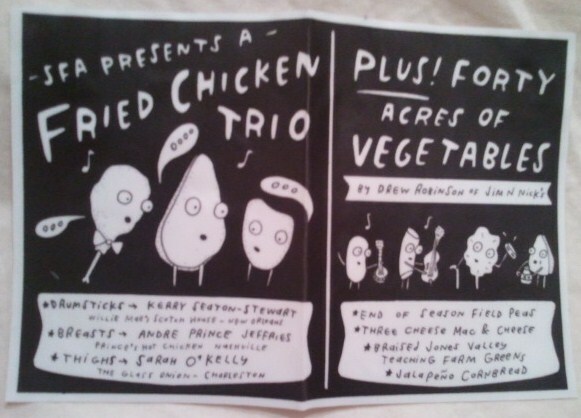 Andre Prince Jeffries of Prince’s Hot Chicken of Nashville was responsible for the breasts. I heard she toned down the usual heat a bit, but I still chased mine with some white bread and a pickle. Sarah O’Kelley of the Glass Onion in Charleston paid homage to Mary Lou Gadsden with my favorite piece of the bird, the thigh. And the classic drumstick came all the way from the legendary Willie Mae’s Scotch House in New Orleans, courtesy of Kerry Seaton-Stewart. I can make a meal out of fried chicken just fine, but Drew Robinson of Jim ‘N Nick’s provided some rockin’ mac-n-cheese, greens, field peas and a plug of cornbread. Yes, I ate a bucket full of food. Then I went looking for another apple pie. My search was unsuccessful. Probably for the best – we still had one more day. 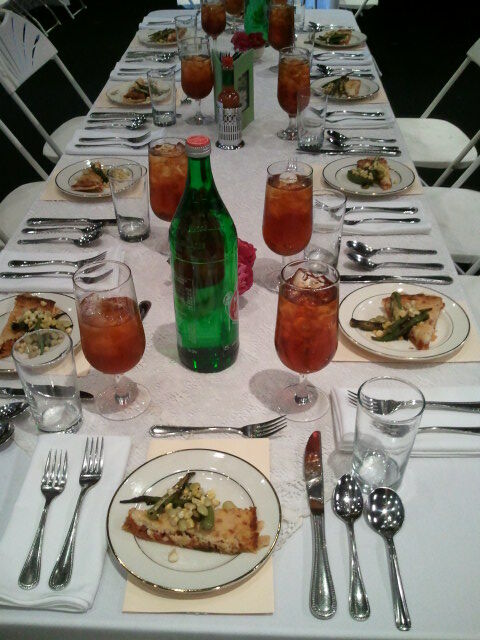 The first full day of the Southern Foodways Alliance Symposium is always full of anticipation. The first time I attended I was anxious because I had no real idea what was in store for me. I got registered, was handed a t-shirt and some uniquely-flavored peanuts, and sat down next to a group that turned out to be on Alton Brown’s television staff. Now, in my fourth year, I don’t get anxious because of the unknowns, I get giddy because I know I am on the brink of quite possibly the best three day event a food enthusiast can find. Our first official meal of the weekend was also the simplest. But don’t be deceived: simple doesn’t necessarily mean plain or boring. As always, the Royal Cup Coffee Company was there to provide our souvenir mugs for the weekend and keep us caffeinated. And for breakfast? We had cake. 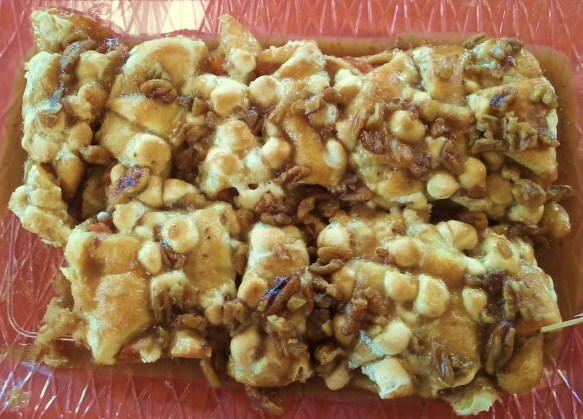 Not coffee cake, not crumb cake – this was a genuine cake. Dolester Miles, pastry chef at Bottega restaurant in Birmingham, gave us hefty slices of toasted cornmeal pound cake – for breakfast – with jars of strawberry and fig jam around to give it a little bling. Not fancy at all, but if I had not known a great lunch was coming in just a few hours, I might have had a …third…piece. Lunch on Day One, I have finally come to realize, follows a pattern. One year it was waiting for us in individual bento boxes, the next we got a shoebox full of more boxes – little metal containers labeled with the food therein, which now hold my paper clips and push pins as well as those taste memories. This time lunch was on a round metal tray covered by a banana leaf. You may wonder how a banana leaf ended up at a meeting focused on southern food. I did, too. Country Captain Revisited was the title given the luncheon. I had heard of Country Captain but somehow never found an opportunity to give it a try. 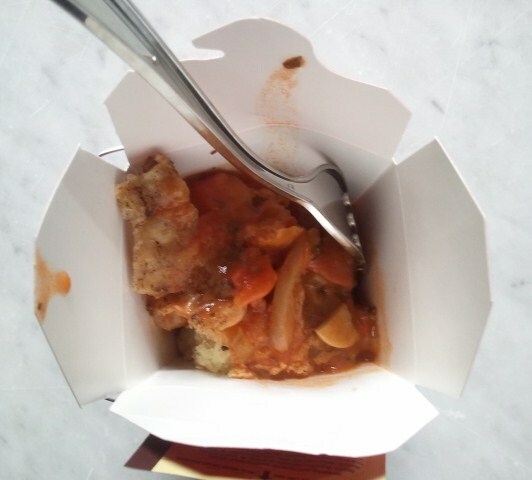 It is a curry-based chicken and rice dish that was likely brought to a southern port city via a British military officer linked to the East India Trading Company. (Definitely the simplified version of the story, I’m sure.) Chef Asha Gomez, originally from Kerala (southwest India) and currently at Cardamom Hill restaurant in Atlanta, took it back to its roots. Since rice is the normal accompaniment to the chicken, she created a version of vattayappam, a steamed rice dish also from Kerala. The green on the plate (besides the banana leaf) was Kale Thoren, which I had to forgo because the word “coconut” was in the description. (The Wife loved it.) The bright pink side dish was – you guessed it – Beetroot Pachadi. (You guessed it, right? At least Pachadi was on the tip of your tongue?) Someone was really trying to get beets into my system this particular weekend. Not bad, but you guessed it again – tasted like beets. Perhaps my favorite side was the sweet potato fritter with tamarind chutney. 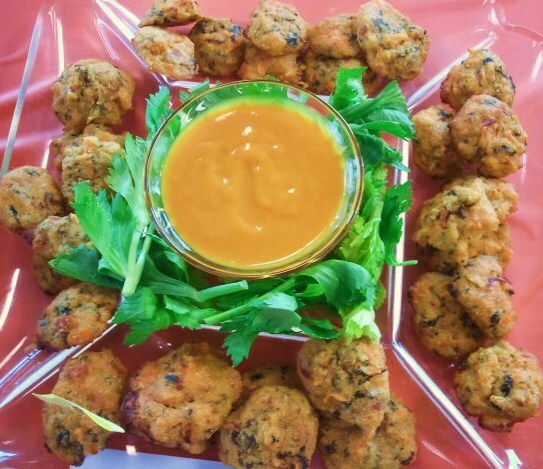 Chef Gomez told us that eggplant fritters are popular in Kerala, so she took one of our favorite Southern ingredients and did a little fusion. I would have scammed The Wife’s, but she liked it, too. For dessert we had Peach and Ginger Fried Pies with Cane Syrup and Jaggery. I had at least a couple of fried pies over the weekend, and this was probably my favorite. Nice by itself, the syrup and jaggery (unrefined sugar from palm sap) gave it the edge over the others. To drink, we had a cup of Cumin-scented Jeera Water. If Wikipedia is to be believed, this is a common drink in Kerala that pretty much cures anything and everything – if you don’t mind drinking cumin, that is. Then again, considering how some of the prescription solutions and syrups I have sold to many of you must taste, it really wasn’t too bad. I need to give a mention to the afternoon snack. Somewhere amongst the fascinating talks about Eugenia Duke and her mayonnaise and Sister Schubert’s roll dynasty, we were given a little pack of Molasses Spice cookies from Grey Ghost Bakery in Columbia, SC. I confess: I ate them till I was dizzy. Not a smart move, perhaps, but Columbia is not a short drive. You do what you have to do. Friday night dinner was another tradition, the Taylor Grocery Degustation. I always figured that “degustation” was just an eleven-letter word for dinner, and that the people who wrote the program were just trying to be creative. The creative aspect may be true, but I took the time to look up the word this time, and this is what Wikipedia told me: “Degustation is a culinary term meaning a careful, appreciative tasting of various foods and focusing on the gustatory system, the senses, high culinary art and good company.” Well, now I know that the program-putter-togethers chose just the right word. The description goes on to say that usually a degustation involves sampling small portions, and as far as the front porch at Taylor Grocery is concerned, that is mostly true. Anne Quatrano of Star Provisions in Atlanta made us little cups of something she called “Re-boiled: greens, peas and Tabasco-smoked catfish.” When we finished that we went inside and sampled some very large portions of fried Simmons Farm-Raised Catfish with all the trimmings. After enjoying some of that good company with friends from New Orleans, we decided to catch the school bus back to Oxford. I remembered that usually there are two front-porch appetizers, and I had only found one, until we headed for the bus. I had consumed much more than my fair share inside, but I still snagged a Griddled Catfish and Eggplant Rice Pocket Bread with Cucumbers prepared by Rebecca Wilcomb of Herbsaint in New Orleans. One for the road. Back at our rented hacienda, our cycle began: eat, sleep, repeat. Bring on Day Two.